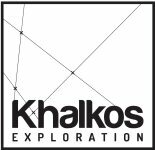 MONTREAL, QUEBEC--(Marketwired - Nov. 20, 2014) - Management of Exploration Khalkos ("Khalkos") (TSX VENTURE:KAS) is pleased to announce additional positive results from its Villebon property. Following the results obtained in the recently discovered extension of Vein 1, (ref: press release November 11, 2014) Khalkos conducted a drilling test and blasting on the vein. About one ton of representative material was blasted and sampled. The six collected samples yielded economic gold values and the results are presented below. Note that many visible gold specks were observed by Khalkos' geologists in most of the samples collected. These new results confirm the excellent potential of Vein 1 as well as demonstrate the possibility of a continuous gold mineralization between Vein 1 and the Cere vein. (Link of the updated map of Villebon: http://khalkos.com/wp-content/uploads/2014/11/carte-mise-a-jour-nov-2014.jpg). Recall that Khalkos now owns all mining titles (56 claims held 100%) covering a multi-kilometer gold bearing shear zone containing high grade gold zones located within 75 km southeast of the city of Val d'Or. Core samples were processed using the fire assay by the certified ALS Chemex laboratory in Val-d'Or, Quebec.